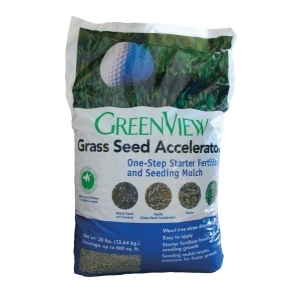 Grass seed accelerator is a starter fertilizer and seed cover. Formulated for fast seed germination, as it fertilizes and protects seed growth. It retains moisture and regulates soil conditions. Accelerator is weed free and totally biodegradable. Apply to newly seeded lawns or to newly seeded patches in the lawn. Apply after seed is sown. Ingredients: Contains: Recycled Newspapers, Starter Fertilizer, Water-Holding Polymer. Unit Size: 30 Pound covers up to 600 sq. ft.